Mme. Leroy is sole owner of this mosaic of vineyard gardens. She makes and ages the wines in her home cellar above Saint-Romain in a farmhouse that dates back to the 12th Century. 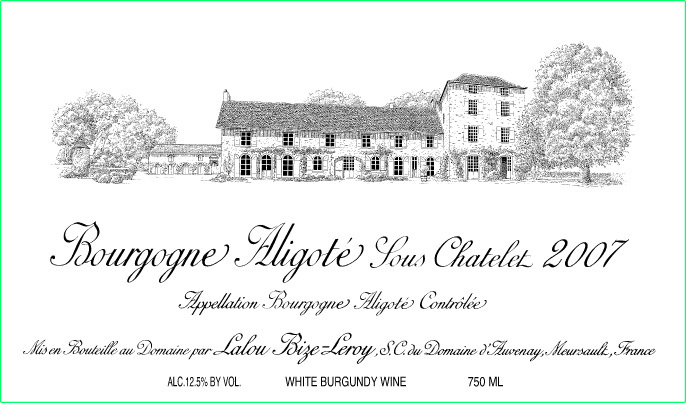 Her tiny quantities of white wines are sublimely intense and complex, even on the more modest terroirs of Auxey-Duresses – the minute yields give absolutely unique textures and a phenomenal finish. Nothing in Burgundy even comes close to the splendor of her Meursault, Puligny and white Auxey-Duresses, to the point where you would have to create a whole new rating scale. She also has almost half an acre in each of the two great Grand Cru red vineyards of the Cote de Nuits, Bonnes Mares and Mazis-Chambertin. 3.9h total – 0.5h Pinot Noir 13% and 3.4h Chardonnay 77% and Aligote 10% – all bio-dynamically farmed.